Astronomy out of the Window? Viewing the Moon through trees at Midnight from a communal urban back garden. 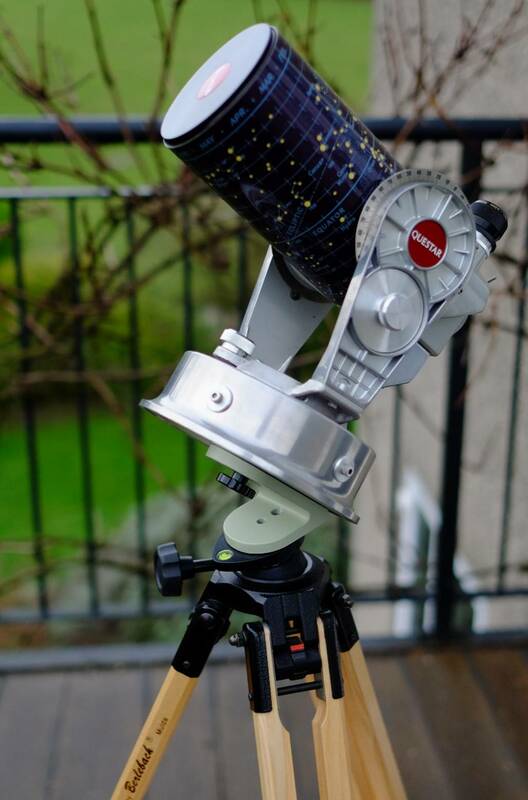 If you live in an urban area, perhaps with only communal gardens, a balcony or nowhere at all to setup a scope, reading my prattles about observatories and grab-n-go scopes probably seems irrelevant, even irritating. I live in the country now and have the space for an observatory, but I grew up in the London suburbs and have spent many years living in towns and cities. Urban astronomy is a problem I’m familiar with. So I decided to collect a few ideas and tips on how to be an urban astronomer and set them out here. I have reviewed most of the gear mentioned elsewhere on this site. Even if you do have somewhere you can set up in an urban area, the scope is going to have to be a portable one; how portable will depend on where you view and how you get there! 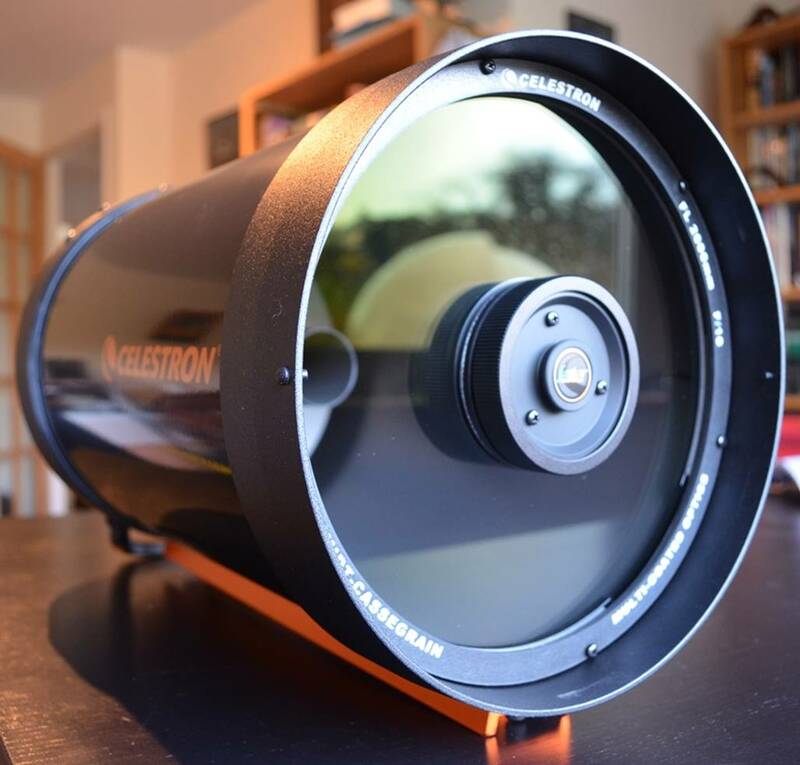 Al Nagler of Tele Vue famously used to do astronomy with a big Dobsonian from a New York sidewalk, but I think you would struggle to get away with that in most urban areas of the UK. Tip: the further you have to travel on foot and the more insecure the viewing site you choose, the more portable your rig will need to be. 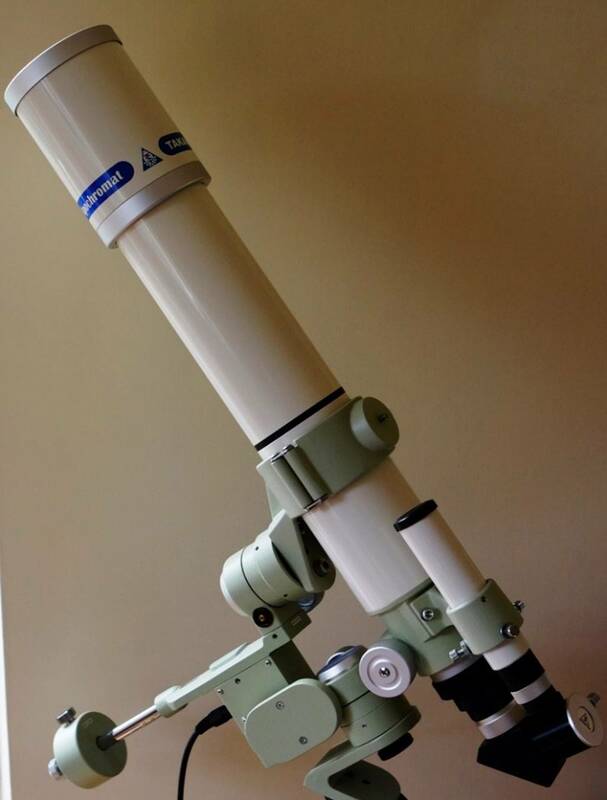 Small refractors in the 2”-4” aperture range on simple alt-az mounts (like the TV-60 rig described below) can work well for the peripatetic urban astronomer. So too can the most compact Maksutovs and Schmidt Cassegrains in the 3”-5” range, which also typically pack down into a small case plus a tripod of some sort. Dobsonians (even the smallest ones) are often a bit big unless you live really close to where you’ll be setting up, or can easily drive and park close to your viewing site. Another consideration is storage: a system that breaks down into small, easily stored modules (preferably in cases) will be easier to keep in a cramped flat or bijou terraced house. Some mounts in particular are much better in this respect than others. Even my big AP1200 mount and pier break down into surprisingly compact units for storage; they’re quick to assemble too. AP has put a lot of effort into designing its mounts that way, but even the smallest (the Mach 1) would need transport by car. Some ideas for highly-portable telescope systems – ones you could travel with on foot or by public transport - follow. Questar 3.5 in table-top mode. Questar: everything fits in one small case. If money were no object and I was stuck in an urban environment with no garden, but where there were nearby public spaces to set-up, I would go for a Questar: it is just so easy to carry and quick to set-up. The Questar 3.5 is still the ultimate small travel scope in my opinion, because the whole thing is integrated into one unit. 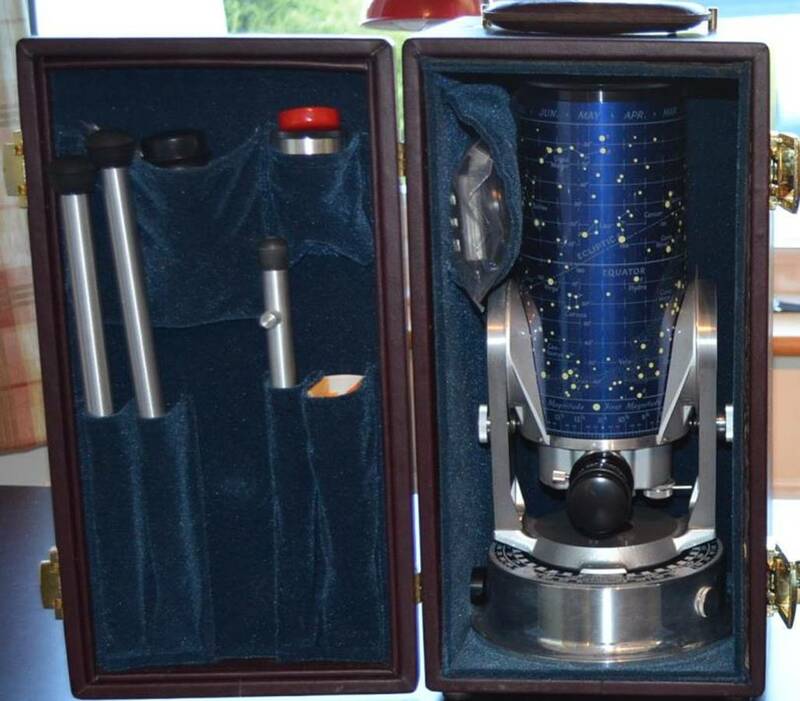 A case that’s about 40cmx20cmx20cm contains the whole system which comes with integrated finder, eyepiece, diagonal, barlow, solar filter, tracking mount and Moon and star maps. There are lots of options to consider with a Questar and it’s far from cheap, but not bad value in my view considering what you get. People dismiss the Questar as poor value compared to say a big Dob’, but that’s missing the point – for ultimate portability and convenience nothing else comes close. 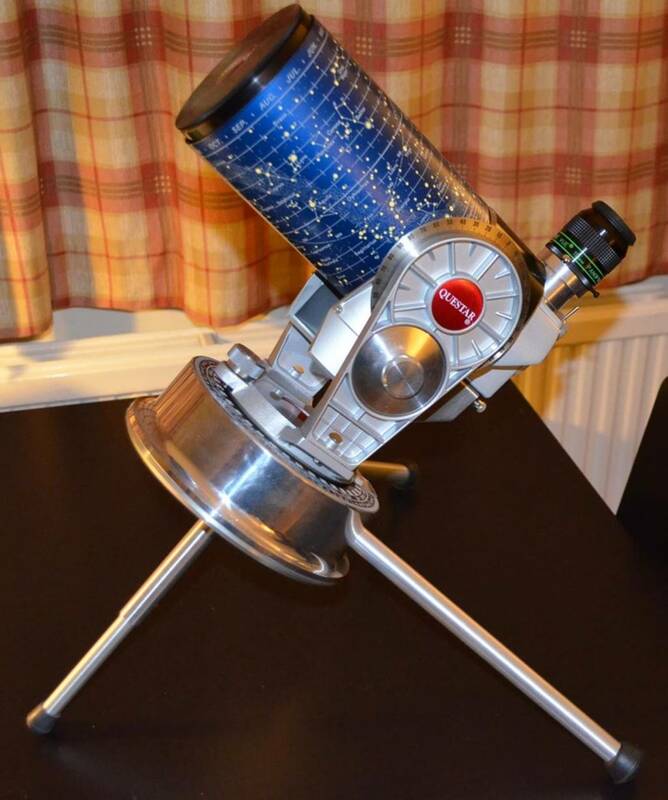 You can literally just take a Questar out of its case, put it on a flat surface (a bench, picnic table, car bonnet etc) and observe in alt-azimuth mode with no messing. I use a small square of leatherette material to stop it scratching the car. The Questar comes with table-top legs to use it as a table-top equatorial. You just take them out of the case, slot them into the ports on the mount base and adjust to your latitude. If you want to tripod mount a Questar, then things get more problematic. The standard Questar pier and wedge is a superb bit of kit, but it’s much too heavy to be really portable. Questar on a light-weight mount comprising a Takahashi wedge and Berlebach tripod with ball-head. Tip: A Questar has a ¼-20 thread in the base so you can create an alternative light-weight tripod mount for a Questar from a combination of a photo tripod and head. 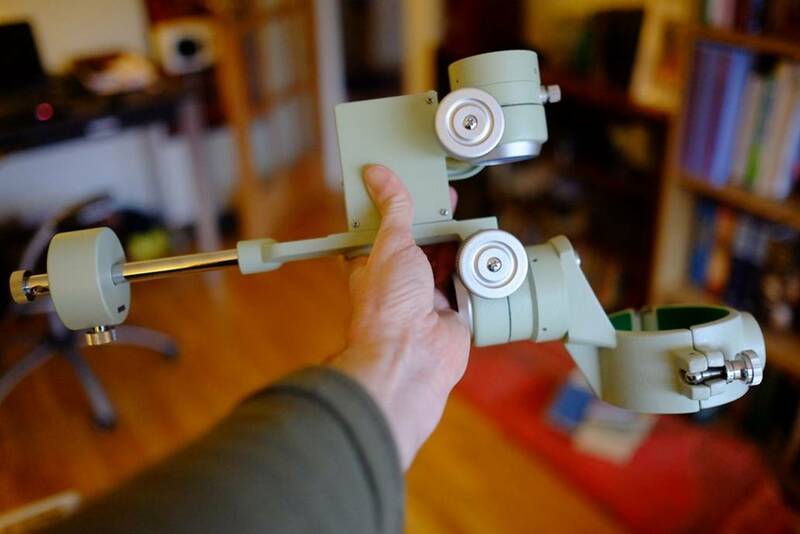 · Berlebach 132 report tripod with integrated levelling ball. The Takahashi V-adapter is just a tiny permanent 45 degree wedge with a ¼-20 screw on one plate that fits the central screw in the base of the Questar and a 3/8 thread on the other that fits the tripod. The trick here is in the levelling ball. Fit the V-adapter to the tripod, then just fine-tune to your latitude with the levelling ball, using the Questar as a polar scope (set Declination zero). The tripod packs up to just 62cm and weighs about 3 Kg with the V-adapter attached. You can get a little carry case for it from Berlebach. The optional tray stiffens it up and gives you somewhere to put stuff. This solution makes a really simple and highly portable mount for your Questar, ready to go and observe as soon as you are! The most portable small refractor system I know of is TeleVue’s tiny TV-60 apochromat mounted on their TelePod alt-azimuth mount. Equipped with one wide-field eyepiece (say a 13mm Nagler T6 or 16mm T5) and a 3-6mm Nagler Zoom, which pack in the standard carry-case, it makes a powerful portable telescope system. But because of its short focal length, you really do need fancy eyepieces like that Nagler Zoom to achieve the kind of higher powers it’s capable of. It’s also worth noting that setting the TV-60 up to observe will involve more fiddling with diagonal, eyepieces etc than the Questar. If you prefer refractors, but want an equatorially mounted (i.e. tracking) system, Takahashi’s FS-60Q modular refractor on their little Teegul mount is about the smallest and most portable system I know. The whole German equatorial mount comes apart into tiny, easy-pack modules, as does the scope itself. In operation, the Teegul is very stable, easy to use and tracks nicely. Meanwhile, the FS-60Q arguably gives a better view than a Questar and is certainly much more flexible because you can easily convert it into a wide-field mini-astrograph by unscrewing the Q-module and inserting a field-flattener. BUT … consider that in truth it’s still nowhere near as integrated, portable and quick to set-up as a Questar. Split-tube FC-76DC is carry-on portable, stable on Teegul mount. Mounted on the Teegul, the FC-76 is a step-up in visual performance from the FS-60Q, though you’d need a flattener for serious astro-photography with the FC-76 (but not for the 60Q at its native F10, anyhow). In either the split-tube FC-76DC version (shown above) or the sliding dewshield FC-76DS it is super-portable, balances very stably on the Teegul with the standard tiny counterweight and is a great little general purpose ‘scope that gives good views of everything, including the Moon and Planets (on which the 60Q is limited by its aperture). The telescopes described above are all easily carry-on portable. By that I mean that the telescope will fit in a cabin bag whose maximum dimension is usually ~22”. But so far we’ve been talking small apertures. What about a larger travel scope for deep-sky imaging abroad or perhaps high-resolution views of a planetary opposition (2018 is the closest Mars will get for a long while, but in Northern Europe it’s barely over the horizon at opposition). Celestron’s C8 is one of the largest aperture scopes you’ll get in a carry-on bag: surprisingly compact and light too. 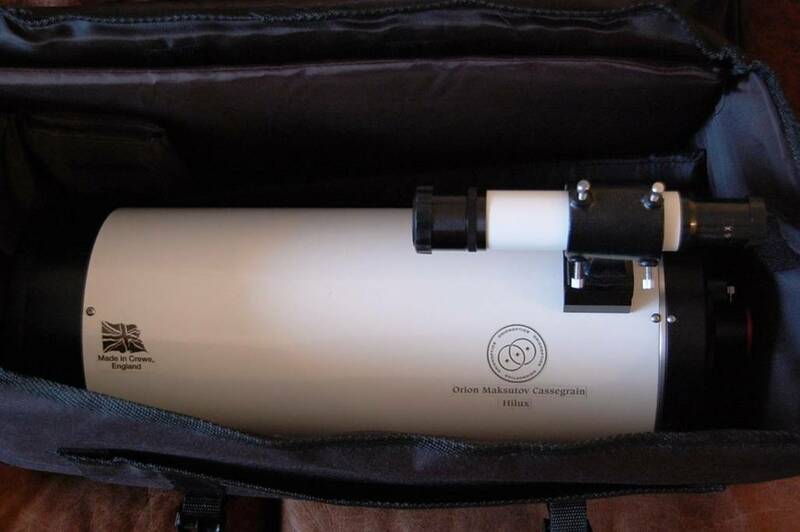 Orion Optics OMC 140 Maksutov nestling in its carry-on travel bag. Tip: refractors that use the 3” Feathertouch focuser can be reduced in length by about 93mm for travel: remove the focuser from the collar and replace with a Starlight Instruments dust cap. This will make all the difference in some cases - for example with the TSA-102. Takahashi Teegul SP2 complete with weight and tube-ring. Teegul breaks down into tiny components. For really small telescopes you may be able to use a larger photo tripod and geared or panning head. 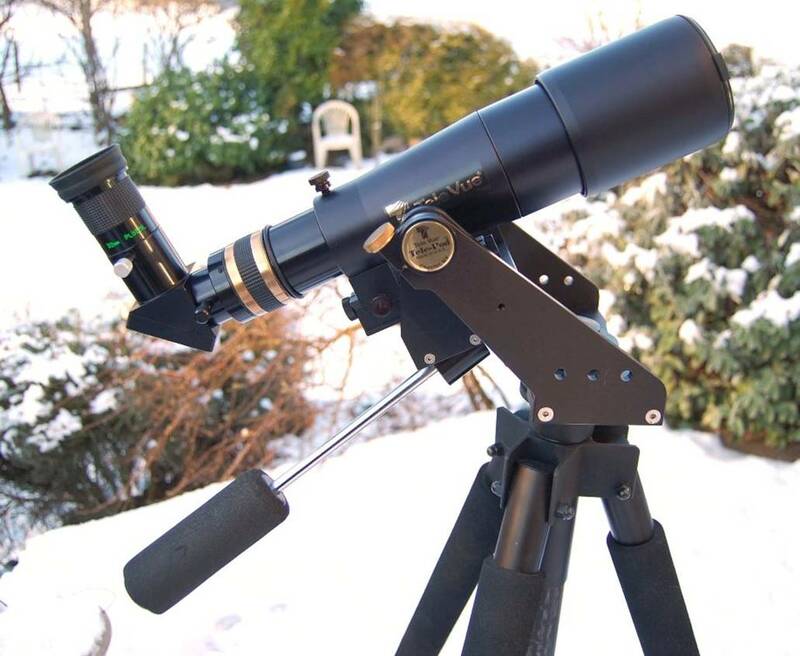 The TeleVue Telepod mount show above is ideal for small refractors like TeleVue’s own. Other small alt-az mounts are widely available, such as Vixen’s Mini-Porta. Borg make a small alt-az with slow motion controls that looks good too and even Sky-Watcher’s basic Altaz mount is very light-weight. Tracking mounts are generally less portable and more fiddly to set up, with their electrics and counter-weights. The Takahashi Teegul already discussed is ultra-portable and needs no external power supply (batteries are in the tiny handset shown), but only takes scopes up to ~3Kg in weight. 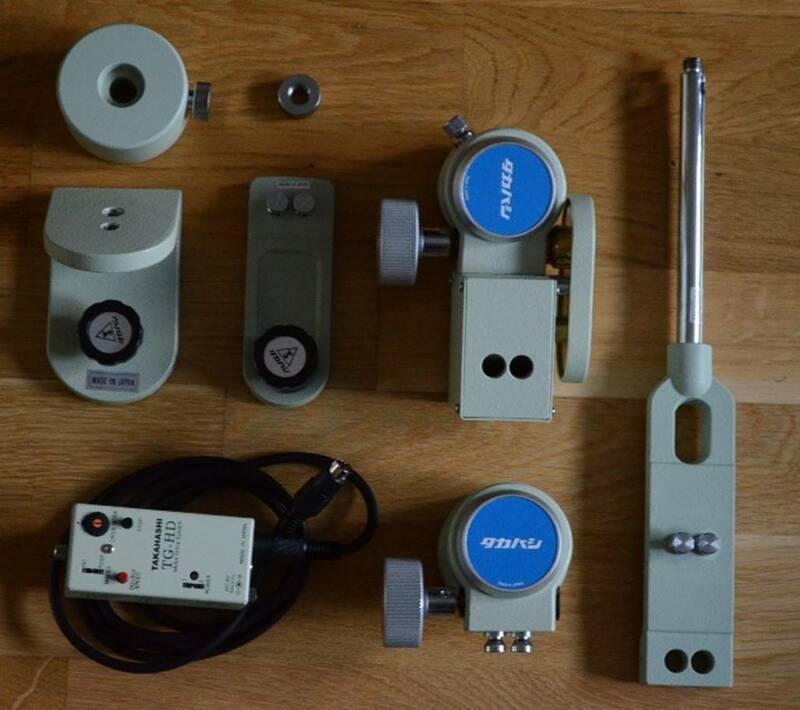 Other small tracking mounts are available for small refractors and SCTs/Maks. However, many larger scopes will need a much larger mount. Some heavy duty counterbalanced alt-az mounts, such as Sky-Watcher’s SkyTee2 may carry many of the scopes listed and are quite portable. Alternatively, a massive conventional alt-az mount such as KK’s T-Rex or the DiscMount DM4/6 may be viable too, but would be much heavier to drag around. If you want a highly portable tracking mount, then Vixen’s SX2 mount looks good – all enclosed and quick to set up, it is very light weight for its capacity (7kg weight/12Kg capacity) and the standard HAL130 tripod is light too. The SX2 cleverly uses the motors as a counterbalance so that much smaller counterweights are required, thus reducing travel weight considerably. It should be much easier to travel with than most mounts in its capacity range. You’ll be needing a sturdy case for your telescope and mount if you’re traveling with it, even locally in the car or on public transport. 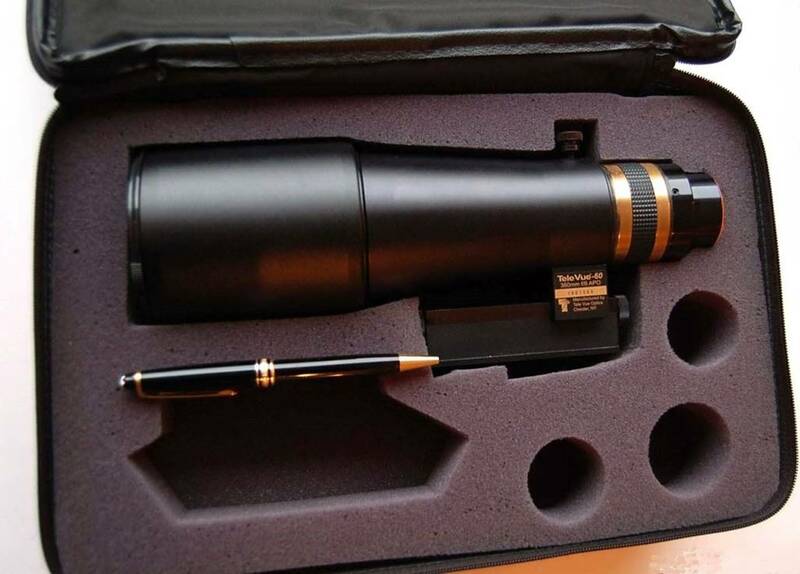 Many telescopes come thoughtfully provided with cases. If not, then hard-shell camera cases with pluck-foam may be adaptable to smaller OTAs. Custom scope case makers like Scope Guard are also worth considering and people have commissioned similar cases from manufacturers that specialise in the kind of hard cases musicians use for their gear. Trouble is, many standard cases are not carry-on size, even if the telescopes themselves are. Firms like Peli’ have designed cases that maximise the carry-on allowance aimed at peripatetic photographers and these may be adaptable. Unfortunately, many of those larger telescopes listed will only just fit under the carry-on limit and a thick-walled hard case may not allow enough internal space for them. If all else fails, you could try sowing a simple barrel-case from leatherette lined with foam and felt and closed with a zip. You can get travel cases designed specifically for some mounts (such as Sky-Watcher’s EQ5 and the Vixen SX2) and for tripods too (Berlebach make cases specifically for most models). Image stabilising binoculars take the shakes out of the view, allowing higher powers than you could comfortably hand hold. Higher-power models give similar views to a small telescope. Various companies make them, but those from Canon – ranging from 8x25 to 18x50 - are most common. Zeiss make the largest (and most expensive) that I am aware of – a 20x60 that employ a purely mechanical stabilising system. 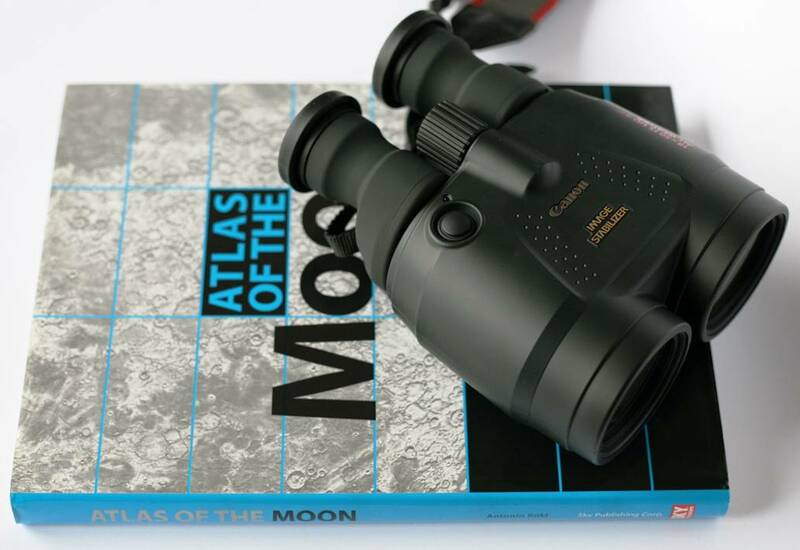 If you have to view from a park bench or some public space like a car park or street where you can’t set up a telescope, image stabilising binos may be your best bet. A pair of Canon 18x50s are compact and easy to take to any local spot with an open sky, yet they can give surprisingly involving views: the major Lunar features, Jupiter’s Galilean moons, Venus’ phases and lots of easy double stars like Albireo. If you can’t afford one of the larger pairs (like those 18x50s), don’t despair. The basic Canon 10x30s and 12x36s are still excellent binoculars that will show you a lot and they can be had for a few hundred quid. I spent many happy hours amidst the vineyard terraces above the Swiss lakeside town of Vevey, lying on my back on a wall and scanning the sky (or finding the lights of distant chalets high in the snowy mountains around) with a pair of Canon 10x30s. 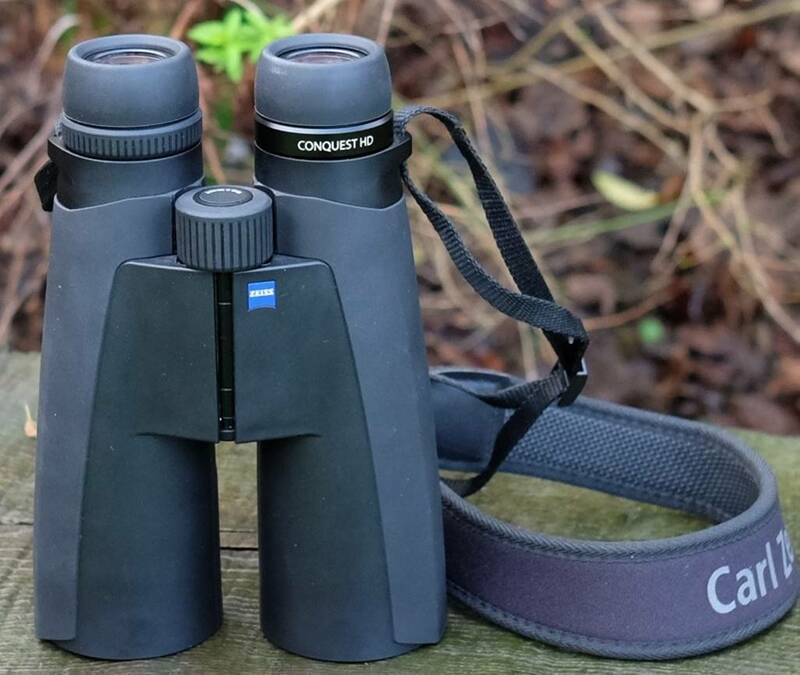 Zeiss 15x56 Conquest binoculars: astronomy from a park bench. If you are put off by the fact that image-stabilisers are essentially an expensive piece of consumer electronics, then ordinary high-power binoculars can work well in an urban environment. Why high power? Because higher powers (i.e. 10x and above) cut through sky-glow better than low powers. So you should be able to find brighter deep sky objects as well as exploring the main features of the Moon. They should also allow you to track Jupiter’s Galilean Moons and spot Saturn’s rings and Titan, perhaps even glimpse Venus’ phase and split easy double stars like Albireo as well. You’ll find 1950s astronomy books recommending 7x50s, but that was from a time when streetlights were about as bright as a candle in a jamjar. These days, 7x is just too low-powered to cut through light polluted urban skies. So which pair of high-power binoculars to choose? 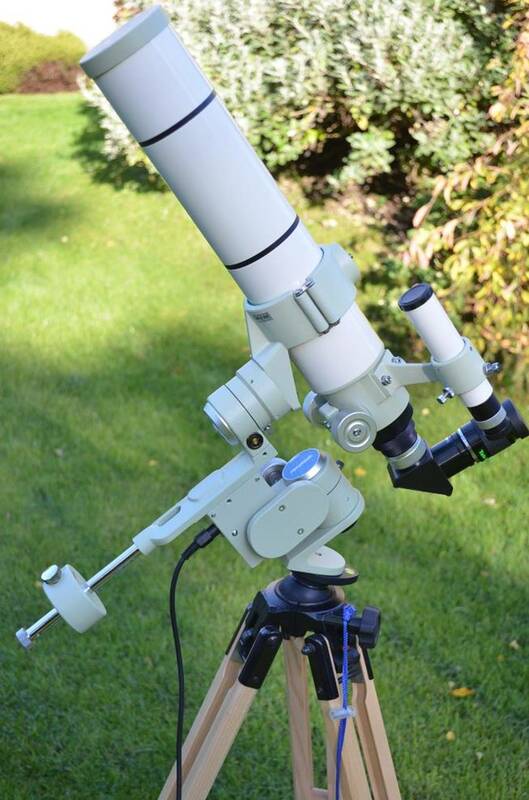 Several good 15x56 models are available, designed for the hunting market but excellent for astronomy too. Zeiss’ 15x56 Conquest HDs are a best buy, whilst Swarovski’s 15x56 SLC HDs are the very best, but more expensive. On a tighter budget, I can recommend Nikon’s 16x56 Monarch 5s. Tip: holding the binoculars around their objectives is a good way to reduce the magnified shakes you get with higher powers. If you want a quality pair of binoculars that can also be used for birding, then 10x42 and 10x50 models can be a good choice. Even a good pair of 8x32s or 10x32s is surprisingly usable for astronomy. 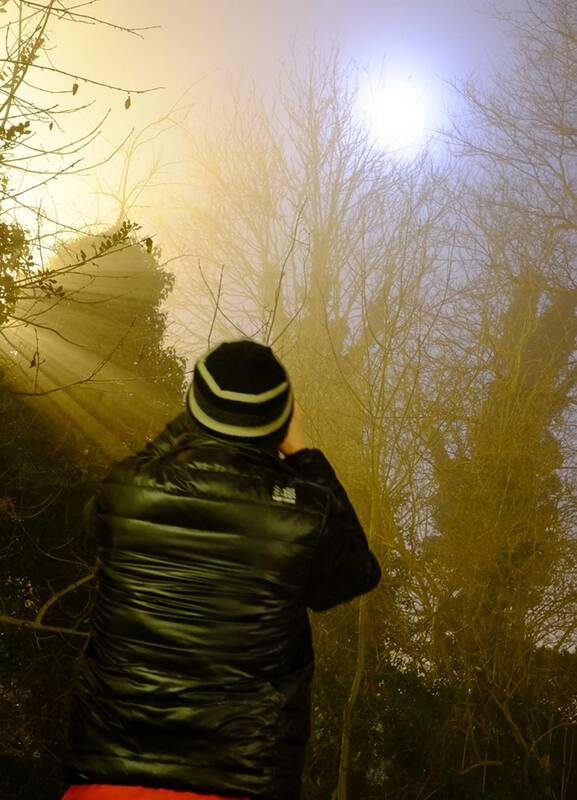 If you get the chance, then jumping in the car or on a train or bus to the countryside could deliver an evening of looking for all those faint DSOs you can’t spot from your (sub)urban home. All you need is your bino’s, a good astronomy app for your phone to help locate things, and a really warm jacket. 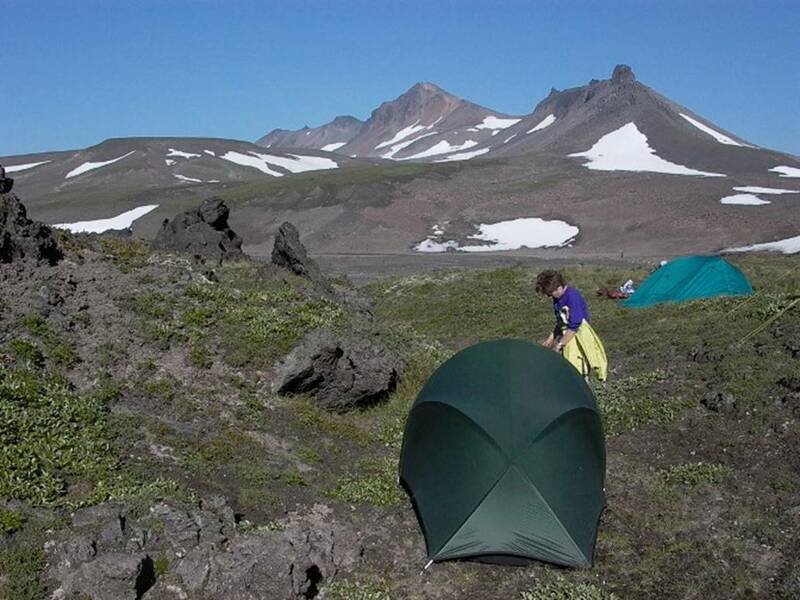 Tip: I find duvet jackets ideal for observing because they are typically light to wear and unconstricting (important if you’re spending lots of time holding up binoculars) but very warm. 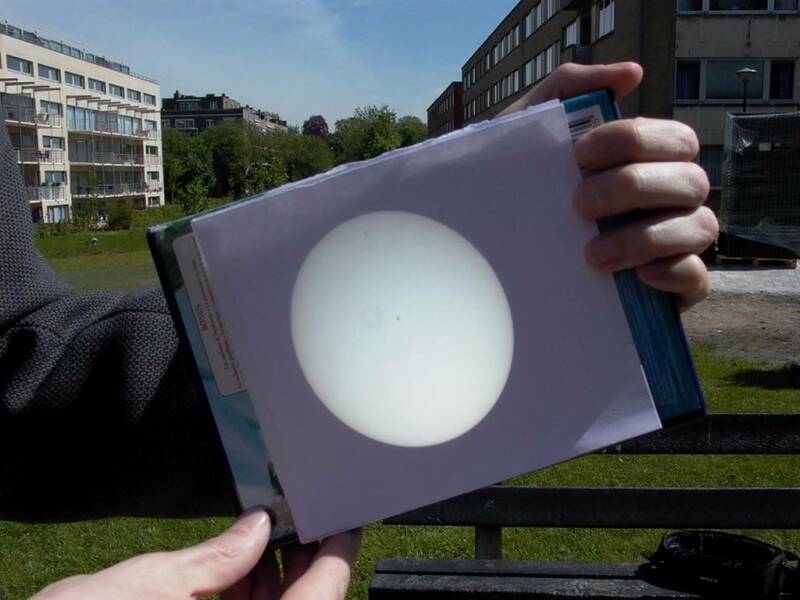 Projecting the Sun with a small Maksutov in an urban park near Brussels. Another urban environment in which I spent a few years was Evere, a suburb of Brussels. We had a flat with a large balcony (big enough to call a terrace), but it was towards the bottom of the block of flats, on a street with another block opposite. The sky view was seriously restricted. It was like doing astronomy through a letter box. Inevitably I used to have to go elsewhere to do astronomy and I used to frequent a small park nearby. Nobody seemed to mind me skulking with my scope on a grassy patch behind the swings, but I might not want to try the same thing in London. There’s safety in numbers and some astronomical societies have regular meetings in an urban park. A good example is London’s Baker Street Irregular Astronomers. Named after the street urchins Holmes employed to do his dirty work, the BSIA meet regularly in nearby Regent’s Park. It’s a convenient location for both urban and suburban astronomers - close to London’s Euston, King’s Cross and St Pancras mainline stations and with decent parking (it’s outside the congestion zone). If all else fails, you could drive somewhere fairly secluded and use a car window mount with a small scope (these are like a tripod head, but attach to a half-lowered window). In similar vein, Questar’s 3.5” models ingeniously include lugs you can screw-in to the base to hang the Questar off a car window, but it looks precarious! 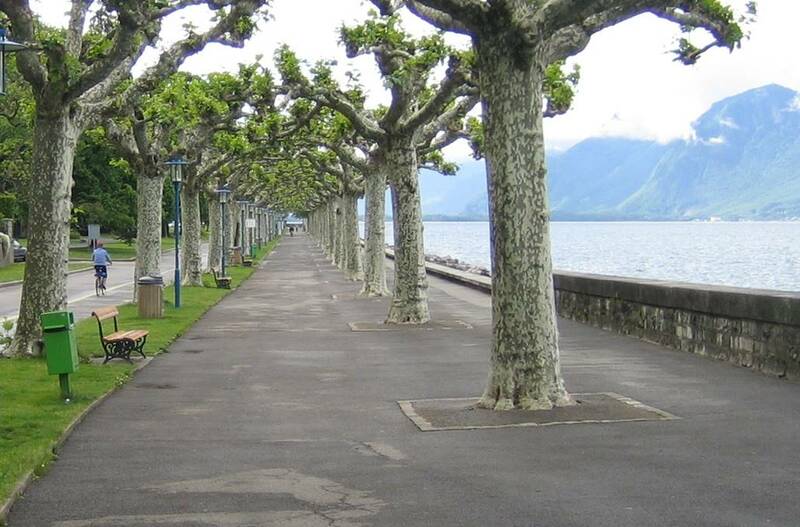 Whilst living in the centre of a Swiss town, I used to set-up on the lakeside promenade in a dark corner right by the lapping waves and hope no one bothered me. One thing that really helped me keep a low profile was Tele Vue’s TV-60 (see above). Not only was the TV-60 small and easy to carry; its satin black finish made it really stealthy on its all-black Tele Pod tripod and mount. I’m sure I got a lot less hassle from the late-night drunks buying pizza across the way than I would have done with a more traditional white scope. Today, many scopes are available in stealthy black (sometimes as an option) – worth considering for urban astronomy, even if (like me) you find white more aesthetically pleasing. No garden? No balcony? Nowhere nearby you can safely set up a scope and observe? You’re not alone. If that’s the case, star parties make a great way to meet other astronomers (and use their expensive gear!) in safety. Old observatories in cities and towns often have open evenings and star parties where urban astronomers can rig-up larger scope systems amongst like-minded souls. Again, think carefully about a setup that’s easy to break down and store away and easy to transport. Alternatively, the observatory may well open its own telescopes up for public viewing. Such events are great fun and can give a real sense of what it was like when professional astronomers worked visually with big telescopes. If most of your astronomy does get done at star parties (or not at all) and you still want a regular astro-fix, you’ll have to be creative, especially if there’s nowhere you can set up a telescope. I tried various ways to grab quick-look views of the Moon, planets and brightest clusters when living in town; like me you may end up viewing from some convenient bench. I tried a 10x25 monocular from a park bench, but it was too low-powered, didn’t collect enough light and was too jiggly. I found larger hand-held telescopes too unwieldy (and let’s face it, they look ridiculous and distinctly pervy used in town). Tip: this is where, in my opinion, image-stabilising binoculars really come into their own. I recall a friend once telling me proudly how he’d designed big skylights into his new loft conversion specifically so he could do astronomy in comfort. I hadn’t the heart to tell him. You see, trying to do astronomy through a window, open or closed, generally doesn’t work very well. Open the window and the flood of turbulent hot air destroys the image like terrible seeing does. But try viewing through a closed window and the poor optical quality of window glass soon becomes apparent. That at least is the conventional wisdom. Is it true? Well, not quite. In fact, modern float glass windows are much better optically than older plate glass. No they’re not 1/10th wave to match your premium refractor or custom Dobsonian. No, you can’t get away with anything like high powers through them. Yes, you get a ghost image from the second layer of glazing. But … try looking at the Moon through your double glazing at 15-20x and you’ll likely be rewarded with a very decent view. I recently enjoyed the tail-end of a Lunar eclipse with binos that way – snuggled into my favourite armchair, rather than shivering outside. If you’re an urbanite with no easy access to the night sky from outside, then viewing through a window with binoculars may actually be a way of enjoying astronomy when otherwise you couldn’t. Tip: experiment with different parts of the window to find a good spot, because the glass flatness does vary a lot from place to place. Obviously kill the lights to prevent reflections. Might it even be possible to have a specially ground and coated small optical window pane installed? No idea, but might be worth investigating. Certainly you could get a small window company to make you a pane of single glazing to prevent those secondary reflections and getting it coated shouldn’t be a problem, either. Similarly, viewing through an open skylight might just work acceptably if you let the room cool right down to ambient temperatures first. Apart from where to set up, the two biggest problems encountered by urban astronomers are restricted views and light pollution. The first problem may be fixable by shifting around to find a gap between buildings or trees, but the second really is not. But don’t despair! The rapid roll-out of LED streetlights already seems to be making suburban skies a bit darker and I have high hopes for the future. In practice, current levels of urban light pollution means deep sky viewing is restricted to a few objects – the brightest nebulae and clusters. And in truth, even these don’t look much when overwhelmed by sky-glow. In fact, I really didn’t do much deep sky observing at all until I moved to the country. The good news is that Solar System observing isn’t affected by light pollution at all. You can enjoy exploring the mountains, craters and rilles of the Moon from a sodium-bathed urban street just as easily as from a dark country lane. Ditto the planets: Venus’ phases; the albedo markings, polar caps and bright clouds of Mars; the rings, polar hood and belts of Saturn; Jupiter’s cloud belts and storms, Great Red Spot and Galilean Moons. The Moon in particular is a great target for urban astronomers and a half-decent small telescope and an app or atlas will give you years of fun observing and indeed sketching its numerous features, some enigmatic and elusive even in the space probe era. Imaging deep sky objects won’t work through strong light pollution, but you might be able to get serviceable images of the brighter DSOs with a sky-glow filter if the sodium glow isn’t too strong. Tip: start with something bright like the Orion Nebula and move to fainter DSOs to see what’s possible with your skies. Again, imaging Solar System objects is largely unaffected by light pollution. Imaging the Moon is really easy – you just need a basic DSLR or compact system camera with interchangeable lenses. Buy a T-mount for your camera and a nose-piece that fits in the focuser (either 1.25” or 2”). Then fit the camera to the scope, focus (probably using Live View to get it right) and snap away. You won’t need a tracking mount for the Moon as exposures will be short. You could try collecting as many lunar phases as you can (late and early ones will be very challenging). You can image the planets through polluted skies too. The traditional way is with a webcam or specialist video camera and then processing the images with frame-grabbing and stacking software. For this you will ideally need a tracking mount and perhaps other hardware, such as a good barlow lens. If you wanted to try some more serious astronomy, you could use a video camera to try to spot meteorite impacts in the dark part of a crescent Moon, which show up as tiny flashes. It should also be perfectly possible to derive exoplanet light curves through polluted skies (how is beyond the scope of this article). A wilderness campsite offers perhaps the ultimate in dark skies. If you’re stuck in an urban environment with limited access to clear (or any!) skies, then one way around it is to travel. Of course, you could travel to a ‘local’ dark sky site, but depending where you live that might be hundreds of miles away. Alternatively, you could jump on a plane and go somewhere with really good skies. The possibilities are almost endless. Many rural parts of continental Europe have good skies, with a better chance of good weather and stable seeing in the south. Quite a few astronomers favour the easily and cheaply (for Europeans) accessible Canary islands, where (on La Palma) there is a major professional observatory and various scenic viewpoints where amateurs can set up and take advantage of the clear, un-polluted skies. Further afield, it almost goes without saying that the high and dry Atacama Desert in Chile has some of the best skies on Earth and hosts many of the biggest astronomy projects, like the VLT and ELT. Those professional observatories are very remote, but the area of the Atacama around San Pedro is on the tourist trail and quite accessible. Much more mainstream is the Desert Southwest of the USA. Many parts of New Mexico, Arizona, Nevada and California have good skies away from the cities and long runs of bad weather are mercifully rare. 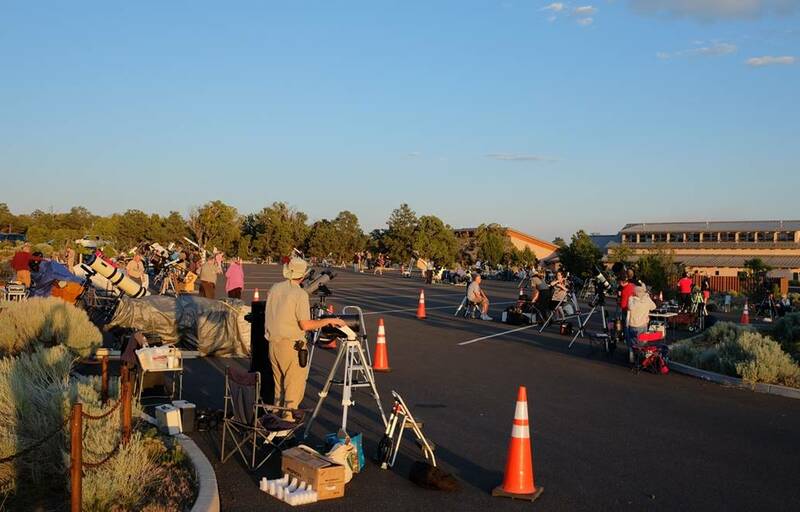 One of the easiest ways to observe under a dark sky in the US is from the campsite or parking lot of a national park and some national parks have organised star parties (the Grand Canyon’s is a major event every June). Some of the big observatories have star parties too and others have astronomy programs that run from nearby national parks (such as Kitt Peak’s binocular astronomy program at Saguaro National Park). Perhaps the ultimate dark skies are to be encountered on a wilderness trek. Again the possibilities are endless, but I’ve personally experienced stunningly dark and transparent skies whilst on camping treks in Iceland, Kamchatka and Patagonia, experiences to remember forever. Another opportunity is to travel to the opposite hemisphere and encounter a world of deep sky objects you’ve never seen before. For a northerner, a trip down under in winter or spring will offer up the Magellanic Clouds and the Eta-Carinae nebula (and others) around the Southern Cross. You wouldn’t really even need a telescope, just a dark sky (shouldn’t be a problem in Aussie) and good pair of 42mm plus binoculars (premium 32mm at a pinch, but no smaller). Travelling for specific big astronomy events (mainly eclipses, but also transits and planetary oppositions) is almost a separate pastime taken very seriously by some. Numerous travel firms cater for eclipse tourism in particular. Tip: if you do travel for a specific object or event, just make sure (using planetarium software) that what you want to see is viewable at a convenient time and altitude when/where you’re planning to go! I plugged the details of the 2017 USA solar eclipse into the software on my phone to see if it’s going to be visible from a favourite camping spot. As you can see, it is!